Discussion in 'Early CJ-5 and CJ-6 Tech' started by Focker, Feb 19, 2016. Post your puzzling piece, part or "WTH did the PO do?" here for a one stop index. What's this? Passenger side front of a 1971 CJ5 frame. Engages a bumper that extends from the axle housing on an arm. Changes the geometry of the movement, so that the driveshaft does not hit the starter. Do you have a mix of vintages? AFAIK the bumpers that extend down from the frame do the same thing, and you would not have them both on the same vehicle. Engages a bumper that extends from the axle housing on an arm. I have a d27 or 30 that has an arm with a snubber on it. I was wondering where it was supposed to hit. Never had the jeep it was attached to so didnt know. ...Do you have a mix of vintages? AFAIK the bumpers that extend down from the frame do the same thing, and you would not have them both on the same vehicle. Who knows? The number stamped into the frame matches the VIN. 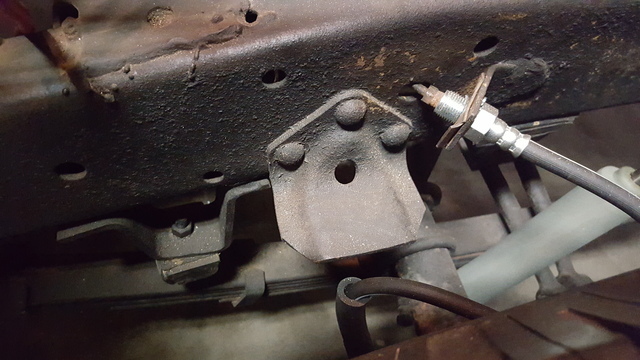 Upon closer inspection...It looks like a PO welded a leaf spring bumper mount (to the left of the factory stop bracket you described). My D27 has no arm or sign of where it was cut off. Also look at the boogered weld for the motor mount. 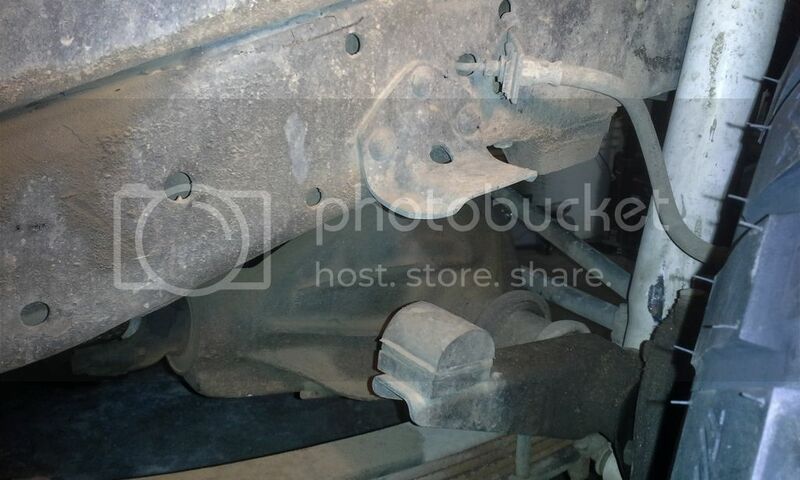 In fact the front part of the frame might be from another Jeep or crappy crack repairs? That weld ... factory quality! I have one too, just like that. It has never been used, l've had my jeep since 78. People have posted questions about that mystery bracket on this forum in the past. Maybe it was part of a running change AMC was doing before the '72s came out. Focker and Beach66Bum like this. hmmm my '71 has that same bracket on the frame but nothing like the picture shows of that arm. I have the bump stop on my D27 original axle, the PO or the pre-PO used a torch to cut the one off of what I am using now. I helped clean it up with an angle grinder and cutoff wheel. Was thinking I might move the old one over to my current application or look for a NOS version (likely hens teeth). I thought it was to help with spring flex when torque was applied, to keep from winding up the spring and putting the front shaft in a bind? The V 6 axel had it on it. Could be that Focker's bracket is vestigial. Last year and all that. Cable bolted to transmission and with a ball in a bracket on the crossmember. It doesn't appear to do anything. Thanks! Restraint cable. Stops chatter backing up. I can't see where that cable makes any difference. Mine is gone, and I don't have any chatter. Except from the munchkins, and they are girls, which makes silence impossible any way. Hellion, cadwelder, Danefraz and 1 other person like this. Yes. Some good in-depth explanation of how this works in the archives. Prevents a feedback cycle developing between the clutch action and body movement when reversing. Alan, I'd say the pictured cable is not "tensioned/taut" as intended. Is that a socket (as in tool) near the center of the picture--behind the cable? Good eye! Yes, I was changing the trans fluid and that thing was in the way of getting the socket on. I originally thought that bracket was supposed to hold the e-brake cable.